Ligaya Amilbngsa with Governor Sahali (right) and ARMM Tourism Officer Nassreena S. Baddinni (left) watching the dance contest of the Agal-Agal Festival on 25 September 2012 at DepEd Compound in Bongao. September is the anniversary month for the province of Tawi-Tawi, which used to be part of theprovinceofSulu. On 11 September 1973, by virtue of Presidential Decree No. 32, Tawi-Tawi became a separate province. 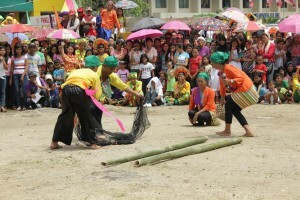 September 2012 is the 39th Anniversary of the creation of Tawi-Tawi. Ligaya F. Amilbangsa (ADC Artistic Director), Nannette Matilac (ADC Managing Director), Mariel Francisco (ADC Secretary) and filmmaker Cynthia Paz traveled to Bongao to participate in the significant activities of the province. Several events highlighted the anniversary celebration. Each participating municipality performs a ten-minute dance number that showcases the cultural and economic life in their localities. Street dancing with colorful floats precede the dance competition of the The Agal-Agal Festival on September 25, 2012. 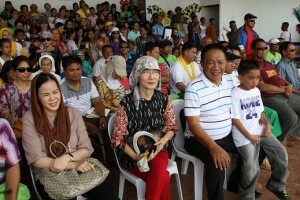 Ligaya Amilbangsa was among the judges of Fluvial Parade on the Strait of Bongao on the 26th of September.